Concept rendering of Harlem River Greenway Link view toward RFK Bridge. The NYCEDC, the NYC Parks department and NYC DOT announced today the results of a study on how to close the 32-mile loop of the Manhattan Waterfront Greenway along with plans to invest over $250 million to get the project started in Inwood, Harlem, East Harlem and Midtown. The Manhattan Waterfront Greenway announcement outlines a strategy for connecting open waterfront spaces that total over 1,000 acres that will add about 15 acres of quality open space and integrate the Greenway into surrounding neighborhoods. 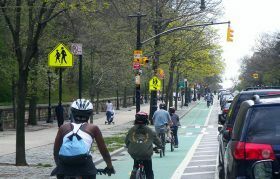 On Tuesday, New York City Department of Transportation (DOT) officials announced a new pilot program that allows bicyclists to follow pedestrian head-start signals at 50 intersections throughout Manhattan, Brooklyn and Queens, AM New York reports. The signals at those intersections have a range of 7 to 11 seconds–known as leading pedestrian intervals (LPI)–before drivers can proceed through the intersections or make turns through crosswalks. Now bike riders can follow these pedestrian signals instead of traffic lights (legally, that is), giving cyclists the safety benefits of added visibility that pedestrians have at those intersections. In May 2015, New York City’s Department of Transportation began an initiative to replace roughly 250,000 old streetlights with new LED fixtures in all five boroughs. The city chose to switch over to energy-efficient lights to save money and time; the lights last 15 years and require less maintenance. Following hundreds of complaints from residents about the harshness of the lights, the city had to then replace these new lights with dimmer bulbs. Now, the American Medical Association (AMA) warns of the potential harmful human health and environmental effects of LED lights, including damage to one’s eyesight and disruption in sleep patterns. 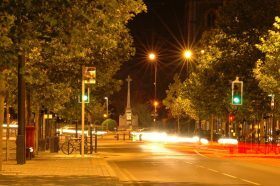 As CNN reports, the AMA has released guidelines for communities to follow when choosing LED streetlights. Leaving a burger half-eaten and making a mad dash to the parking meter may soon be a hassle of the past. The new ParkNYC app allows users to pay for parking with their smartphones, eliminating the need to feed parking meters with cash or credit/debit cards. 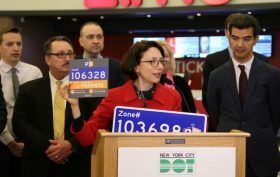 This month ParkNYC zone numbers will be rolled out as decals and signs between 14th Street and 59th Street, from the East River to the Hudson River. By the summer, all 85,000 metered parking spots in the city will be payable with ParkNYC. 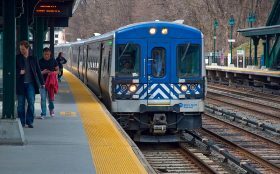 “New York finally joins the ranks of a lot of other cities,” DOT Commissioner Polly Trottenberg told Metro.